According to news sources, today captain of PIA Lahore to London flight PK-757 got a cabin crew member off-loaded from the aircraft. It's alleged that the off-loaded cabin crew member was investigated in the past for his possible involvement in smuggling of narcotics through airline's aircraft. The captain said that he did not feel comfortable by the presence of the particular cabin crew member aboard the aircraft. In solidarity with their colleague, the other cabin crew members threatened to perform duty on the aircraft. Later the matter was resolved by PIA officials. Today, PIA Boeing 777-200ER registration AP-BGL departed from Lahore at 12:25 PM as flight PK-757 to London. The flight's scheduled departure time was 9:30 AM. AP-BGL had arrived in Lahore at 9:42 AM as flight PK-710 from Manchester with a delay of more than two hours. Flight PK-710 was scheduled to land at Lahore at 6:10 AM. Operating Captain refused to fly on Lahore to London flight as one cabin crew rostered was previously convicted in a smuggling case on a London flight. Under normal circumstances it’s a nonissue as operating Captain is the leader of the team and responsible for all their deeds and misdeeds.He is fully justified in refusing permission to take onboard one junior steward whose replacement should have been arranged by Airport management. But militant union took a stand and delayed the flight for 04 hours and caused huge loss to PIA. Chairman PIA Saqib Aziz has taken notice of the incident and ordered investigation. PIA cabin crew association says that their colleague was unfairly off-loaded from the aircraft by the captain. Allegations of narcotics smuggling against the off-loaded cabin crew member were not proven by the investigation. Karachi, 16th September 2018 - PIA’s flight, PK-757, from Lahore to London on 15th Sept, Saturday witnessed a minor argument between the Flight Captain Anwaar Chishti and Flight Steward Awais Qureshi. 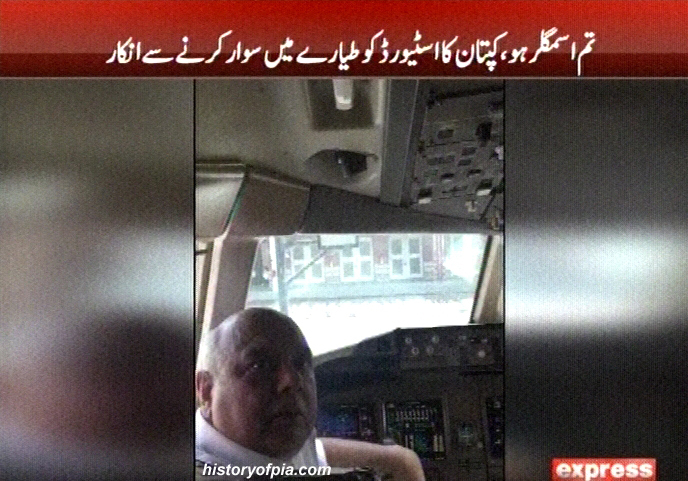 Chairman and CEO PIA Muhammad Saqib Aziz while taking a notice of incident has ordered an inquiry on this matter. According to PIA spokesperson, the flight was delayed consequentially due unavailability of aircraft which arrived from Manchester with delay of 2 hours.